It's certainly safe to leave the chip out since it's connected to nothing other than Vcc & gnd. I took mine out. Looking at that close-up on Erik's site, it looks like the trace from 116.8 to 107.13 (the X4 signal) has been cut and redirected to pin 1 on IC99. That's one of the inputs of a nand gate, the other input is connected to a wire that wraps around to the top of the board that has been cut. The output of the nand seems to be routed to both inputs of another nand to invert the signal again and routed back to 107.13. When X4 is true and location 377 (input) is being read, the K register will start shifting data in. I wonder if the wire that was cut allowed another input channel that bypassed the buttons. Should the switches otherwise act normally? Erik does report that his Kenbak does not work like he thinks it should. Memory does not seem to be written. If the lights are displaying the wrong thing this might be why. Should the switches otherwise act normally? I seem to recall that Herbert Eisengruber (Nova Scotia) had some type of machine interfaced up to a Kenbak-1, but maybe I just dreamed this up. 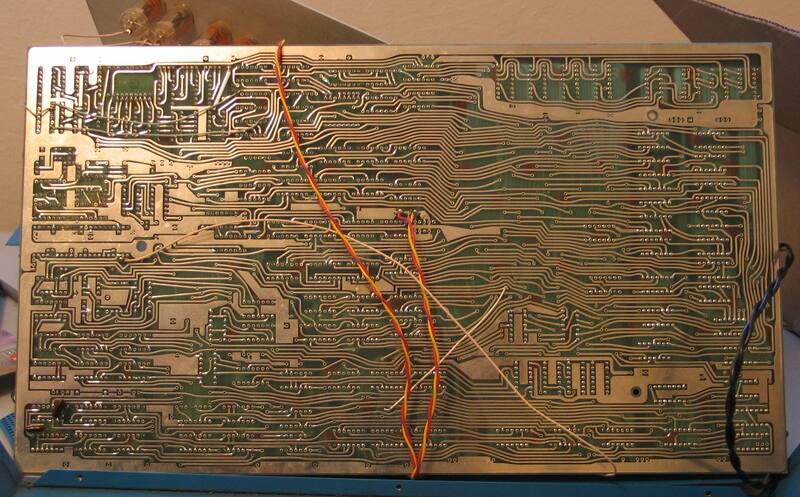 At one VCF meeting, in the pictures, I thought he had some later hardware that was hooked up to a kenbak-1, but now I can't find a source, and the pictures don't make that clear. towards the bottom right of the picture is a photo showing a kenbak-1 with a later box on top of it. Was this a input/output interface? If anyone knows Herbert, maybe they could ask him. Herbert's machines came right out of a technical school, so I wouldn't expect them to have the modifications such as a privately owned machine could have attained. 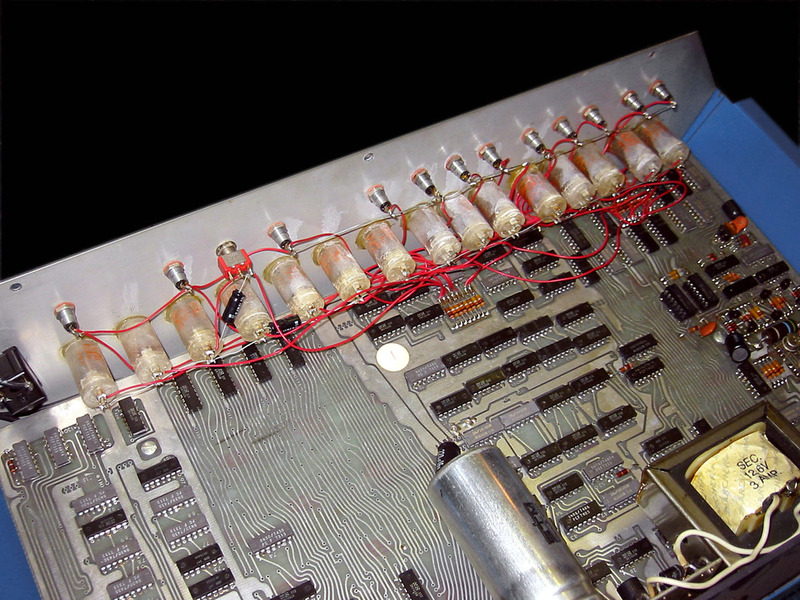 In any case, maybe we'll never know details of why Erik's machine was modified, as a whole-big circuit board with lots of logic could have been interfaced into those few signals, and all that is long lost. Oh, and Grant: I didn't get to the bank before they closed, so no money order. I'll definitely get it mailed by Saturday, priority mail. Don't give my kit away to anyone else!!! Last edited by Grant Stockly; 09-10-2012 at 09:18 PM. At page 8 (last page) he refers to three machines: the prototype, the one that is now in the Computer History Museum and one modified by his son.